When we travel and discover the world, we go on two journeys. The most obvious, the one we can capture in photos to show friends and family back home, is the outer journey: the places we go, the beauty we see, the adventures we have, and the people we meet along the way. But perhaps the most transforming is the inner journey: the things we learn, how we grow, the challenges we face and perhaps overcome, and most importantly, how it changes our perspective on life and our world view. We can share our experiences of both journeys with others, but of the two, the inner journey is the only one we can take back and integrate into our everyday lives. Project World School facilitates both journeys by providing culturally immersive learning opportunities in a supportive community environment. As part of the retreat experience, participants are encouraged, not just to be passive observers, but to actively engage with the local community in a meaningful and lasting exchange. Cultural immersion allows us to celebrate the people and traditions that make every place unique. By bringing travelers and locals together in an exchange of ideas, values, and experiences, we are reminded that travel isn’t just about what we can take away with us. It’s also about what we leave behind. When we travel in a group with others, there is a natural tendency to develop a sense of community within that group, through sharing experiences, meals, adventures, and the responsibilities that help the temporary community function well, like taking care of each other, cheering each other on, listening to each others’ triumphs and challenges. Even taking turns cooking and cleaning up afterwards brings value to the group. But when we widen the circle of community by discovering, interacting, supporting and being of service to the local people and culture, we become global citizens. Many cultures throughout the world pride themselves and rely on a sense of community, welcoming the connection that comes from sharing their culture, their values and their way of life with others. By becoming a part of that community, even for a short time, we come to see that our own way of life is just a small part of the vast human diversity that exists in the world. 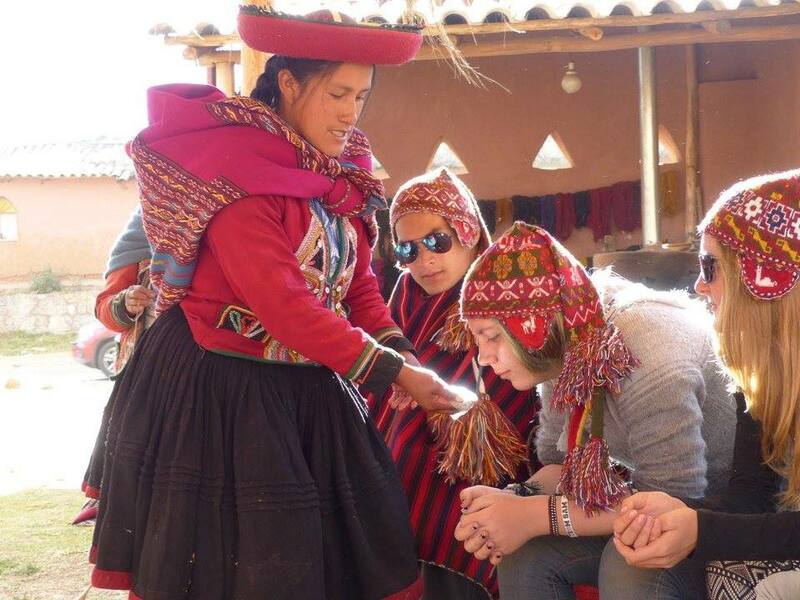 Project World School encourages interaction with indigenous cultures through community based learning projects, volunteering, and participation in everyday life. But it is often the unexpected and unplanned encounters, interactions, and discussions with the local people we meet that provide the best insight into their joys and challenges. Many indigenous cultures are struggling to preserve their traditions in the face of advanced technology and globalization. Sharing those traditions is one way of ensuring their continuation. And it provides the opportunity to explore an aspect of the local community that has meaning to us or expands upon our interests. The most obvious skill we learn when we travel is the art of communication. There’s no better way to learn a new language or practice what we already know than to dive in and ask questions, test our words and learn new ones. But we can also delve into learning about and identifying indigenous medicinal plants with a local mentor. Or help prepare a meal with a local family and learn about the cooking methods, ingredients, and flavors that are unique to the people and place. Every culture has something original to offer as a means of creative expression, survival, tradition, or craft. Unique learning opportunities can be found in traditional dance, sports and martial arts, spiritual practices and rituals, sustainable practices, textiles and weaving, music, endemic animal studies and archeological exploration. When we discover a new place, it’s not always easy to put ourselves out there and really be present in an unfamiliar environment. It takes a leap of faith, inner confidence, a strong desire to step outside our comfort zone, and trust in the community. But when we see the world as our classroom, we make a long-term investment in ourselves. Cultural immersion asks us to push past our limits by saying yes to new experiences: daring to try out a few words in a new language, testing our physical limits or fears by climbing a little higher, walking a little further, diving a little deeper, taking the lead, making new friends, asking to be heard, speaking up. By experiencing a new place and people authentically outside the boundaries and comforts we’re used to, we become active participants, present in time and place, doers in the moment. Challenging ourselves with new experiences often breaks down barriers to how we see ourselves and how we perceive others. Immersing ourselves in a new culture helps us confront preconceived notions of other people and places by giving us a better understanding of humanity in all its diversity and similarity. When we have the chance to see how people from different backgrounds and cultures live and learn, not as part of a faceless group, but as individuals with needs, emotions, interests, desires, joys and challenges similar to our own, it helps us break down stereotypes and deepens our sense of compassion for others. Creating together in seriousness, or exploring in playful laughter lets us understand that underneath our outward differences, we’re all on the same inner journey. Project World School | Inspiration, Osmosis and Empathy: What Can We Learn From Each Other?